Nine-year-old Peat and her sister, Marlie, live at the Overhang, a simple rock shelter they’ve made into a home. They care for a small herd of cattle and survive on their wits and the meagre supplies their aunt brings from the neighbouring settlement of Skerrick (a name as dismal and gritty as the place). A stranger passes through one day and Peat gives him directions to Skerrick. She is unaware that he is carrying a deadly disease. When the townspeople become ill, Peat is blamed and chased from the only home she’s ever known. Peat is alone and frightened. She travels aimlessly, only wishing to survive. Along the way, a small but strange creature joins her. The agile sleek keeps Peat on her toes as he bites and scratches but also supplies her with food. She cannot decide whether he is a friend or enemy, but has no choice but to follow him. He leads her deep into the marshes where she is trapped by Eadie, one of the Marsh Aunties. Peat’s leg is broken. Eadie, a healer and storyteller, decides that Peat will be her apprentice. Peat wants her freedom, but her broken leg keeps her from fleeing. In the meantime, Eadie teaches her the power of words. Peat is a fast learner, intrigued by the magical influences the Marsh Auntie’s stories seem to have on real life. Eadie has business in The Hub, a multi-storied metropolis a few days away. She bundles Peat into a boat and they set out on the river. The sleek travels with them at times but disappears without warning. His loyalty is still a puzzle. Peat’s leg grows stronger every day and, by the time they reach the Hub, she is healed and begins to plan her escape. Soon after their arrival, Peat misses her only chance to run. This is a dangerous mistake as she quickly discovers that Eadie has a debt to pay and Peat’s life is the price. 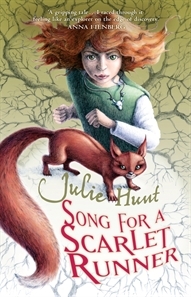 Song for a Scarlet Runner is the story of a young girl’s search for truth, friendship and family. The characters are unique and memorable and Peat inspires great empathy. She is feisty, brave and intelligent. Once I opened this book, she rarely left my mind until I had finished. Peat’s character invites the reader to become totally immersed in her story. The multiple twists and turns in Song for a Scarlet Runner will enthral any child over the age of 12. This fast-paced, emotive book will leave the reader smiling. Julie Hunt lives in a mud brick house with a composting toilet on a farm in southern Tasmania. As a child she wanted to be a boy, a ballerina or a trumpet player. We are lucky – she became a writer instead. She attended a festival in Ireland which helped her to write Song for a Scarlet Runner. For more information on Julie Hunt, please visit: http://www.juliehunt.com.au.